With tomorrow’s iPhone SDK Road Map announcement, we should expect to have most of our questions about the next stage in developing for the iPhone answered. Prior to the announcement, I would like to make a few last minute predictions about things we might see and hopes for things I would like to see. In October of last year, October 17th to be exact, Apple quietly released that they were developing an iPhone SDK. This came to the relief of the community as the current “Web 2.0” iPhone SDK wasn’t quite doing the trick. As we all know, late February came and went without any iPhone SDK announcement, however last week we got of word of the iPhone road map event. What I find particularly interesting about the announcement is the lack of definitive answers or explanations. 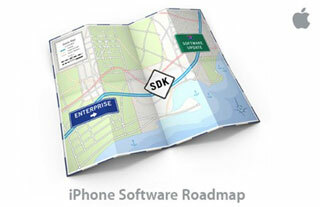 On the invitation, pictured above, “iPhone Road Map” indicates this isn’t going to just be about an SDK. This should be our hint that this event is about the iPhone, not the SDK. Get the difference? I think we will see applications singed by Apple and distributed through iTunes. I feel that the developers will have the option to set a price, but I hope that it isn’t required. As for the limitations imposed by Apple and the SDK, I also hope that developers aren’t severely limited by restrictions imposed by Apple. I’m sure Apple understands the potential of the iPhone SDK and won’t compromise features without good reasoning. I sincerely wish that Apple is going to mention something about games on the iPhone and the iPod Touch! On Tuesday, Jobs said “[the] impending SDK release for the iPhone and iPod Touch [will] open the market for new opportunities for gaming”. Multi-touch is a highly innovative interface that has great potential for gaming. We will see games either coming from the iPhone SDK or only through Apple or selected developers (as the iPod Games currently are). Again, preferably free- because everyone loves free things and there are plenty of developers willing to develop games for donation only (or free). On the invitation is a sign that says “Enterprise”. This probably means that the iPhone will become more Enterprise friendly via the SDK or a slight Software Update. Something as small as an update to allow Microsoft Exchange support to something larger- which can finally attract big business customers. Only Apple knows for sure. If we see all of this happen tomorrow, I would be very happy. Honestly I feel that Apple is going to throw us a curve ball that may for be for the good, but also for the worse. Apple has been very protective of the iPhones security- which is a good thing. We can always wish, so while not quite as plausible, Apple does currently hold patents for mobile distribution which they may use. If you could browse and download the applications through iTunes, on the go- that would be awesome! Whatever comes from tomorrow, it will be for the better. One of the three recently introduced iPhone commercials about car shopping. It has been added to The Daily iLife podcast today, which you can subscribe to in iTunes or watch here. Say your out shopping for a car, and the salesman says, “This is the best deal in town, guaranteed”. But lets say you want a second opinion- thats when having the entire internet on your phone sounds even better. A reader asked (a little too long ago) a couple questions about Time Machine. Here are some answers. When Time Machine keeps writing backups of everything you do and all you are doing is writing huge failed movie files how do find the files on your Time Machine disk to clean house? The answer for this is quite simple. At first you might think that deleting a file from Time Machine is redundant, but when you have multiple copies of files that are very large- your disk space is precious! When you enter Time Machine, simply highlight the file (or folder) you want to delete from backups and click on the Gear menu item. An option “Delete file from all backups” will be present, and this is what you want! To prevent it happening in future backups, you may want to go into the Time Machine System Preferences pane and click on the Options. From there, you can specify what you don’t want Time Machine to backup. Be it your Final Cut project file, or Movies folder. Is there a way of telling TimeMachine to only go to work at night? Apple does not provide a solution to this issue, but you can use TimeMachineScheduler, which will allow you to specify a 1-12 hour period for backups and a slew of other options for customizing Time Machine backups. This should do the trick. If you or someone you know have any questions for theiLife, feel free to Contact Us!